As mentioned in my previous blog articles, the proportion of individuals in our society with Celiac Disease is anywhere from 1 to 3 percent. However a much larger proportion of individuals may have what is referred to as Non Celiac Gluten Sensitivity (NCGS). However Non Celiac Gluten Sensitivity is usually much less severe. It does not involve the presence of anti-tissue transglutaminase antibodies (i.e. the main antibodies measured to diagnose Celiac disease) or the presence of associated autoimmune diseases (such as diabetes mellitus, dermatitis herpetiformis, hypothyroidism, primary biliary cirrhosis and microscopic colitis). As such, Non Celiac Gluten Sensitivity is much harder to detect. It is also much more difficult to suspect as the majority of presenting symptoms (such as mental cloudiness, headaches, muscle and join pains etc.) occur with many other conditions, and if not severe enough usually do not motivate us to seek medical diagnostic help. We may simply brush them off as being unrelated to anything or as simply having a “bad day”. Although the main markers of inflammation found in Celiac Disease are not present in NCGS (e.g. interlukins) there usually is some infiltration of the intestinal lining with inflammatory cells that exceeds normal levels. Biopsy samples usually do not show any pathological changes. Nonetheless, the presence of extra inflammatory cells and the presence of uncomfortable symptoms on exposure to gluten indicate that there is inflammation going on. Non Celiac Gluten Sensitivity has not yet been shown to be associated with increased risk of intestinal cancers (like the lymphomas) or to the autoimmune diseases associated with Celiac Disease. However, the presence of symptoms (especially diarrhea, bloating, abdominal pain and constipation) and the presence of inflammation, indicate that damage to the intestinal lining does occur. Malabsorpion of essential nutrients and vitamins likely also occurs to a certain extent. As mentioned in my previous blog articles, the most common of these are the fat soluble vitamins A, E,D and K, calcium, vitamin D, folic acid and vitamin B12. Deficiency of any of these produces clinical disease states that were explained in my previous articles. Alternating diarrhea-with-consitipation also creates an environment favorable for bacterial overgrowth. Thus,supplementation with probiotics to prevent this from happening is vital. The moral of the story is this. 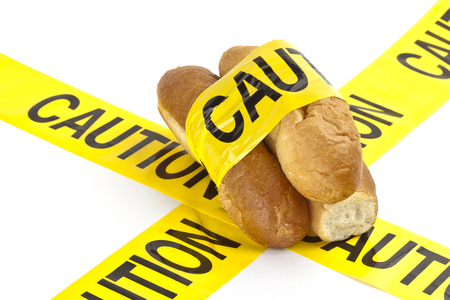 Non Celiac Gluten Sensitivity is extremely difficult to diagnose. Only 40-50% of individuals with this conditions test for anti-gliadin antibodies (an older test to detect Celiac Disease that is not commonly administered due to newer markers). So, many individuals in our society may be suffering from NCGS without ever knowing that the symptoms are caused by gluten sensitivity (especially gluten from wheat). Anyone who consumes wheat products on a regular basis and that frequently experiences any of the symptoms mentioned above should try a gluten free diet to see if the symptoms stop. This may take up to three weeks on a gluten free diet. There are so many people suffering from frequent gastrointestinal complains, headaches, mental cloudiness and join mains that never get diagnosed. Most of us don’t go to a doctor from such complaints especially if they are not severe. Even if we go for testing having NCGS, the condition usually does not get diagnosed and the search continues. Usually we get frustrated with all the additional testing (which many times is quite invasive) and we give up the tests. The symptoms continue but we decide to live with them because we get used to them or because they are not severe enough to continue testing. However they still decrease our enjoyment of life and our quality of life. A simple way to test if the symptoms are due to gluten sensitivity is just to stop gluten in our diet and see what happens. If you feel better, bingo! You found the cause. But remember that if wheat was your primary source of carbohydrates you must now substitute this source with a gluten free product. Great examples are while rice or brown rice and vegetables in general. Without complex carbs in your diet, you may not be giving the brain and muscles enough fuel which may also lead to mental cloudiness, headaches and fatigue. As a final note I found myself recently to be Non Celiac Gluten Sensitive, and applying this simple test of gluten free diet has dramatically changed the way I feel; especially with respect to energy, mental focus and clarity. All the best. Thanks for reading! Categories: Digestive Health, Gluten-Free | Tags: celiac, Gluten sensitivity | Permalink.